Niger coach Gernot Rohr believes his team can cause a surprise during the group stage of next year's Africa Cup of Nations in South Africa. 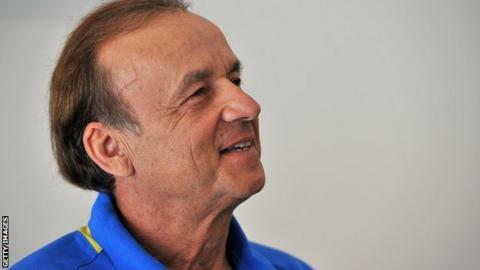 After Wednesday's draw in Durban, Niger learned they will face Ghana, Mali and DR Congo in a tough Group B.
Rohr took heart at being based in the coastal city of Port Elizabeth, as he says the hot and humid conditions will suit his players. "We must learn and we must make progress", he said. "And why can't we win our first ever points in the tournament. We think we have a lot to deliver". Niger lost all three group games, against co-hosts Gabon, Tunisia and Morocco at their first ever Nations Cup earlier this year. Rohr had first-hand experience of watching Niger then, as he was coaching Gabon, but since his move north, Niger have qualified for the Cup of Nations at the expense of Guinea. "In our group we have three of the best teams in Africa", Rohr continued. "We would like to make a surprise, but we know it's very very difficult. We don't have superstars, but we think we can handle it". If they are to do well in South Africa they will need striker Moussa Maazou to be at his very best. Now at Tunisian side Etoile du Sahel, the 23-year-old has been amongst the goals for CSKA Moscow and Monaco in recent years, and his goal against South Africa in qualifying for the 2012 tournament helped Niger prevent Bafana Bafana from progressing. Niger will not be one of the most heavily supported teams at the tournament, but the German-born manager has every confidence his players will feel welcomed. Niger coach Gernot Rohr believes his side can win a first ever point at the Africa Cup of Nations. "I think some people from Niger will come, I hope so. It will not be thousands of supporters, but the most important thing is not the numbers, but the quality," he said. "I think we will have very good support here." Rohr added his team will play a friendly match in November, against Togo, and one or two more before the tournament starts, with Tunisia mentioned as likely opponents. Former French World Cup winner Marcel Desailly was also in Durban for the draw, and the Ghana-born player was also keen to praise the efforts of Niger in qualifying. "Niger performed well, they have done very good things, so Ghana have to be focussed", he said. "We should be able to say, no matter who is coming, we just have to respect them and do our best." Niger open their campaign in South Africa on 20 January against Mali, followed by DR Congo and finally Ghana.